The Città Metropolitana di Palermo, ex regional Province of Palermo, has its headquarters in Palazzo Comitini, one of the most beautiful and prestigious mansions in the city. The 18th century historic home sits in the heart of the city in via Maqueda 100, close to the Fontana Pretoria and the 17th century “Teatro del Sole”, known as the Quattro Canti. Its aristocratic, Late Baroque facade seems to dominate via Maqueda, embellished by its columns, pilasters, balconies and cornices. The building was commissioned by Michele Gravina y Cruillas, the Prince of Comitini, who dreamt of magnificence when building it between 1768 and 1771. The family history of the Princes of Comitini is rooted in Rollo, the First Duke of Normandy and can boast amongst its ancestors: captains, judiciaries, prelates, ambassadors, the grandees of Spain, magistrates, geniuses of art and folly. Part and parcel of the history of Don Francesco, the mind behind the “Villa of Monsters in Bagheria - which intrigued Goethe, Brydone and Houel; as well as belonging to Admiral Federico, defeated by Nelson in the battle of Trafalgar. The Comitini blason, with two gold bands and two checked ones on a blue background with a silver star, is marked by the motto “Spero” (I Hope), revoking Tomasi di Lampedusa’s motto of “Spes mea in Deo est”. The main entrance stands solemnly between granite columns next to which is a further doorway of almost identical dimensions. Nicolò Palma, architect to the Senate and the nephew of Andrea Palma who designed Villa Giulia, planned this palace. The facade comprises a first floor, called "piano nobile" (the noble floor), embellished with ornate, cast iron balconies. In 1931 Nicolò Palma’s building underwent changes commissioned by its new owners, the Provincial Administration of Palermo, today Città Metropolitana di Palermo. Palazzo Comitini became monumental with the addition of another floor, in keeping with the style of the building, accentuated by an attic cornice, while the nine doorways on floor level were altered, becoming Renaissance style windows. Passing through its doors, which are set between two billiemi marble columns and under the elegant loggia supported by double columns you can reach the central courtyard. On the right, there is a stone fountain embellished by a fresco representing Diana the huntress. Your eye is drawn to the grand staircase, spectacular in its design, with its Liberty style windows and ornate, lace-like iron work. On either side of the grand staircase two stone plaques recall the foundation of the palace in 1771 and its extension in 1931. As you walk up the stairs, on the second landing, there is a Baroque style pedestal on which stands a small marble Michealangian statue of Christ and further on, a painting of the Madonna and Child which recalls the late remodelling of Leonardo’s vulgate. At the top of the staircase is an arched loggia whose balustrade overlooks the courtyard below. At the end of the loggia, set within an exedra is a fountain: a shell with a cherub and a dragon from whose mouth flows a sparkling stream of water. On either side of the entrance there are two mouth shaped stone torch snuffers from which waft the acrid smoke of the torches once snuffed here . The first chamber is the Grand Vestibule, once the Chamber of Arms, decorated with architectural frescoes of interiors and exteriors: spring landscapes, vases of plants and flowers, windows onto imaginary gardens, perspective illusions, trompe l'oeil covering the walls and barrel vault ceiling. This leads into the Yellow Chamber, separating the private rooms of the palace from the public ones. Panels above the doors depict Sicilian Greek-Roman ruins. Two landscapes painted by a follower of Jacob Philipp Hackert reveal the Neoclassical ideals of nature. A number of paintings by nineteenth century and contemporary artists ( F. Lojacono, Giambecchina, Beppe Vesco e altri) are also hanging here highlighting a cultural renewal. The Green Room sparkles with its valuable "console" and with its enormous mirror decorated with portraits of the Barons of Malvica. A white Murano chandelier hangs overhead illuminating the painted panels above the doors: two landscapes and the seasons. They have been attributed by Maria Accascina to Elia Interguglielmi, one of Southern Italy’s finest painters between the end of the 1800s and the beginning of the 1900s, reminiscent of the French painter Boucher. Various paintings and sculptures decorate the room. The Red Room is warm and welcoming, with its above-door panels signed by Interguglielmi depicting allegories of good government: Concordia is denoted by the cornucopia and the Caduceus; Peace by an olive branch; Prudence by a snake and a mirror; Temperance by a bit and harness. Portraits of the Duke and Duchess of Reitano are also on the walls. The severe Sala Sciascia, where the Giunta of the Province of Palermo used to meet, houses a collection of canvasses by Maria Giarrizzo, Ida Nasini Campanella, Renato Guttuso, Pippo Rizzo, Michele Dixit, Salvatore Mirabella, Lia Pasqualino Noto, Rocco Lentini, Umberto Valentino, Laurenzio Laurenzi, Mario Folisi, Eustachio Catalano. Inserted into the geometry of reason is the bronze bust of the author of the Egyptian Council, Leonardo Sciascia, by Mario Pecoraino. A triumph of Late Baroque, known also as the Hall of Mirrors, or the Ballroom, is an exaltation of the sacred and profane, reflected in the ambiguous light of those fifteen mirrors that like pilasters thrust up towards the ceiling, crowned by oval paintings. The beautiful Majolica floor comes from Neapolitan kilns and is signed Attanasio. On the vaulted ceiling, framed in an oval cornice, Truth flies through the air, sitting on a chariot drawn by cherubs. The sumptuous group of angels proclaim with trumpets and scrolls that “vero piacere trionfa” (true pleasure triumphs) and furthermore, that “delle torbide voglie la strage al vero piacer forma il trionfo” (torpid desires are the annihilation of the true pleasure which forms triumph). In the four corners of the ceiling the artist has painted the cardinal Virtues seated on clouds, bursting in femininity: Fortitude clad in red and confidence like Minerva with a helmet and shield; Temperance dominates and holds back Haughtiness with a bit and bridle; Prudence dressed in a golden cloak holds a mirror; Justice shines in turquoise holding her scales and sword. The ballroom displays mythological and biblically inspired panels above each door which are lit by two monumental Murano chandeliers. There are 17th century paintings from the workshop of Pietro Novella, Alonzo Roderiquez, Mattea Preti, Regnier Nicolas, Mattia Stomer, Massimo Stanzione and by anonymous Italian and Flemish artists which were adapted to their 18th century surroundings. The proud figure of Michele Gravina y Cruillas, the Prince of Comitini, dominates the festive scene. In 1770 he entrusted the decor of his stately home to Martorana, the probable author of his portrait, in which there is the evident influence of Van Dyck and Batoni. Heading back, to the right of the Yellow Room, there are the private apartments: the bedroom and two boudoirs next to the so called “rooms of plates”: two precious Palermitan Rococo caskets, showing small Murano mirrors on the walls of the rooms. The Prince’s magnificent Rococo bedroom is today the boardroom of the highest authority of the Institution. It carries the gloomy tone of Caravaggio and the solemnity of the 17th century followers of Cavallino, Mattia Preti and Bassano with paintings representing Jesus and the Good Samaritan, the Beheading of John the Baptist, Lot Leaving Sodom, the Entrance of the Animals into Noah’s Ark, Jesus at the House of Mary and Martha and the Dinner in Emmaus. Three rooms complete the itinerary: the Administrative office, the Room of the Fireplace and the Winter Garden. In the Room of the Fireplace, now dedicated to Salvo D’Aquisto, there is a collection of paintings by Renato Guttuso, Bruno Caruso, Mario Delitala, Saverio Terruso, Croce Taravella and Paolo Madonia. The Winter Garden houses a coffered ceiling, a Liberty style lamp and furniture. 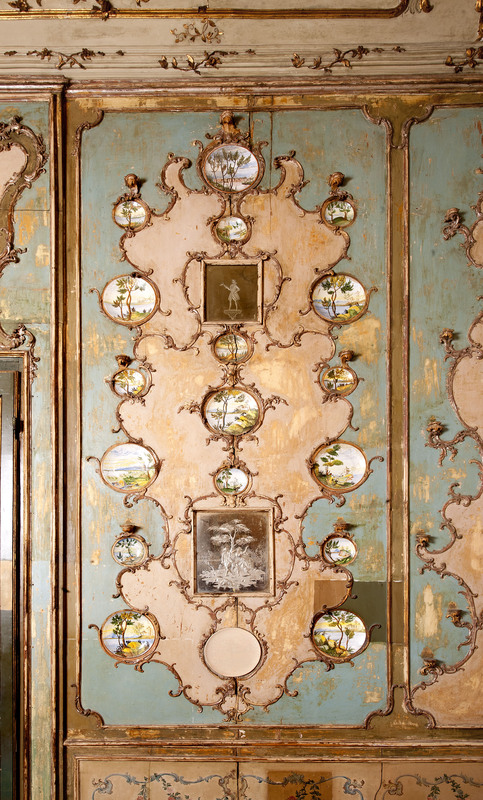 19th century paintings by Piera Lombardo, Domenico De Vanna and Giovanni Filippone decorate the walls. Palazzo Comitini is a treasure collection recalling the interiors of the film "Il Gattopardo" (the Leopard) with its Baroque staircases, Majolic floors, frescoes and canvases on the walls, luxurious sofas, precious furniture, damasked apartments and its ballroom, resplendent in gods and demi-gods. It was the aristocratic home for 150 years of the Princes of Gravina. In Sala Martorana on Decembre 23th 1945 la “Consulta Regionale Siciliana” approved the project of what would be the current “Statute of the Sicilian Region”. Woman with a Jug and Woman at the Fountain were painted by Ettore De Maria Bergler evoking Late Realism and Liberty décor. The vibrant landscape painting of the Gulf of Palermo Seen from St. Erasmo was painted by Giacomo Marchiolo; the warm vision of a C. Buscemi Landscape; the Cloisters of San Giovanni degli Eremiti by Salvatore Marchese, bursting with Mediterranean flora. Others are by: Salvatore Maddalena, Mario Mirabella and Michele Mirabella and a realistic bronze bust of D. Morelli by the sculptor Mario Rutelli – who placed the grand bronze chariot, ready to fly up into the clouds, on the roof top of the Politeama theatre.